I opened my Sunday newspaper this weekend and noticed an unusual ad stuffed among the many circulars. 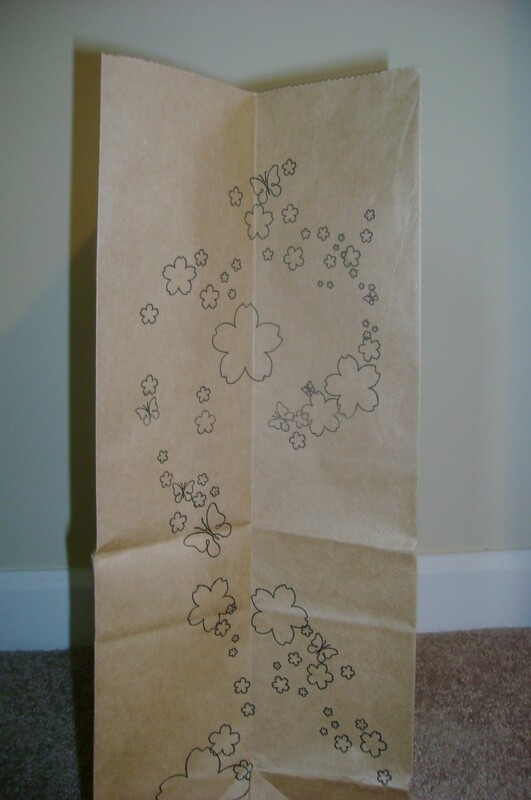 The ad was a full-sized grocery bag, and it was anything but subtle. 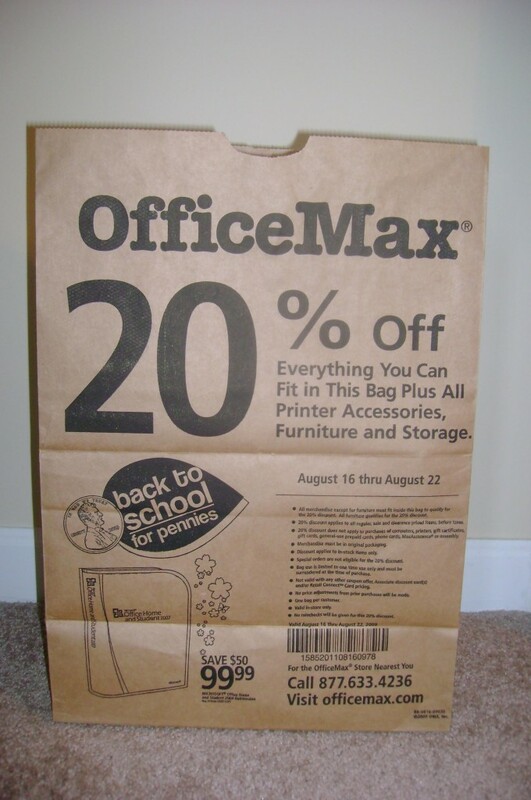 Office Max’s promotion runs from Aug. 16 to Aug. 22 and gives shoppers 20% off everything they can squeeze into the brown bag. If you’re thinking how best to fit a new office chair into the bag–don’t worry. All furniture qualifies for the discount, according to the small print. Computers, printers, and a few other items are among the unfortunate few that do not qualify. Thanks for covering this. Very interesting advertisement and modus of offer. This option has been available in newspapers for quite some time. Although it presents some technical challenges for inserting machines, newspapers have been able to make improvements to avoid errors (i.e. pieces sticking together.) This has been commonly used by office supply stores, and occassionally home improvement stores. As noted, it is a great way to stand out and takes advantage of the wide distribution of Sunday newspapers; and can be targeted by zip code in most cases. Menards home improvement stores have been using this type of bag coupon as Sunday newspaper inserts for years. I agree that it seems much more attention-getting than a 20% coupon in an ROP ad. In Northampton, Massachusetts, this has been used in the local paper for many, many years twice a year for dozens of cooperating downtown merchants. 1)Just before the Xmas shopping season starts and 2)For a summer sidewalk sale. It’s interesting to see this type of media being used as we are developing a new way to target custom map clients. It will be one of our maps printed as an 11 X 17. Then we are going to print an envelope to match the map and sending to CEO’s. We think it will be a huge success – I will check back to this thread and give feedback. I saw this too and I thought it was an excellent idea! I just happened to be at OfficeMax that Sunday as well, and normally the place is a ghost town. However this Sunday there must have been ten people running around with their bags. Very good idea! I think both Office Max and Office Depot have used this method for a few years. The repetition suggests that it works. We took our two oldest to Office Max to gain the discount for back to school shopping, a trip that is never on the cheap. $80 (no graphing calculator needed thank god) then 20% off. My question is, do newspapers get the same readership they once did? I only got the newspaper with that ad because my father came over and had it with him. For promotions marketing veterans, the old “everything you can fit in this bag” offer is as old as The Man in the Hathaway Shirt. Let’s talk about the Mad Men era. People who’ve come up in different marketing disciplines still differ in fundamental ways and skill sets. Direct marketers see everything in relationships. Brand advertising proponents see the brand story holding the most value. Digital marketers covet engagement and interaction. Promotions people value behavior change and bottom-line sales. These marketing disciplines are converging at breakneck speed. The media convergence is turning into a marketing mash up. In this environment, it’s supremely important for marketing pros to learn as much as they can about all marketing disciplines. The new marketing playbook needs to take just the right pages from each of the formerly separate playbooks of direct, promotion, digital and advertising — plus PR, database marketing and market research. The new currency that brings value to our clients is in guiding brands through this convergence mash up. These have been around for years and they do seem to work. At least they do on me! Miguel, I enjoyed reading your post regarding the convergence of the disciplines. It would be interesting to look inside this Office Max promo to see if it was a component of an integrated strategy or simply a tactic to get people into the stores for a short-term spike in sales. The element I’d add to the playbook is staff sales training to increase the average transaction value and build a relationship. I’m on the same page as Miguel (response above mine, Sept 1). Love the reference to this type of offer being as old as “The Man in the Hathaway Shirt”… It’s true…and adding to the list of “baggers” is Old Navy. Though many of the tactics in a promotion marketer’s bag of tricks have been around the block, many — like this one — remain effective. And as MG says, in this green-over-busy-technologically-driven age, the key is in effectively leveraging the various marketing disciplines so that folks will fill that bag. Because if no one knows about the offer or cares about the store/brand, that bag will end up holding recycled newspapers at the curb. Great post! I loved the idea!